MAREST, PIERRE-GABRIEL (Maret, Marais), Jesuit, missionary; b. 14 Oct. 1662; d. at Kaskaskia, Illinois, in 1714. Marest became a Jesuit novice in Paris, October 1681, and spent the next six years as an instructor at Vannes. After several years of additional study in Bourges and Paris he was sent to Canada in 1694. At this time an expedition under the command of Pierre Le Moyne d’Iberville was outfitting to try to wrest Hudson Bay from English control. Marest was assigned to the post of chaplain; “contrary to my inclinations” wrote the young priest, who was eager to serve among the Indians. On 10 August the expedition set sail from Quebec in two frigates, the Poli and the Salamandre. Keenly alert to the new experience, Marest kept a running account of the voyage. About the end of the month they reached the strait leading into Hudson Bay; by 24 September they entered the Nelson (Bourbon) River. Also emptying into the bay at this point was the Hayes (Sainte-Thérèse) River on which the English had built York Fort. The Poli was berthed on the Nelson and the Salamandre under Iberville’s command, on the Hayes, “whither I followed,” wrote Marest; the vessel was “near being lost” before it was finally anchored. Iberville urged Marest, who was running a fever, to go ashore, but the conscientious priest was unwilling to leave the ship as long as it was in danger. Marest continued his ministrations to those under his care through the dreary months of an arctic winter. Scurvy broke out among the crew and Marest was himself afflicted. So far, opportunities for learning the language of the Indians had been few and interrupted. He had been supplied by “Monsieur de la Motte” (Nicolas, son of Pierre Aigron*, dit Lamothe?) with a good many words, and “an Englishman [probably Henry Kelsey] who knows the language very well has given me many more.” Marest carefully made a dictionary of all these words, “according to our alphabet” and translated the sign of the cross, the Pater, the Ave, the Credo and the ten commandments. In the summer of 1695, Iberville returned to France with his English prisoners. Marest chose to remain behind to serve the 80 men left in garrison and when, in September 1696, the Hudson’s Bay Company’s ships retook the fort, he was sent to England to spend some months in prison. Marest returned to Canada (probably early in 1697) to find that his life’s ambition was to be realized. In 1698 he was assigned to the Illinois country, to the mission of the Immaculate Conception, founded by Father Jacques Gravier, which served a confederacy of tribes including the Kaskaskias, Cahokias, Peorias, Tamaroas, and Michigameas. In the autumn of 1700 the Kaskaskias decided to move south to be closer to the French for protection. Marest and Gravier accompanied them. 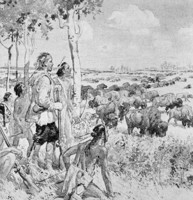 After four days’ travel they halted at the mouth of the Des Pères River, almost opposite the Cahokia or Tamaroa mission, served by the priests of the Séminaire des Missions Étrangères. The spot proved somewhat close for amicable relations, for the Jesuits considered that the Seminarians had encroached upon their field of labour. The matter of jurisdiction over the Illinois missions was referred to Versailles, and when an ecclesiastical commission decided that the Cahokia mission belonged to the Séminaire des Missions Étrangères the Kaskaskias once more continued the trek. The village which they finally established in the spring of 1703 was to earn renown as Kaskaskia. The new community had to face many problems – among them drink and its attendant vices. Marest was obliged to seek help from Jean-Baptiste Le Moyne* de Bienville, governor of Louisiana, because Canadian traders were openly debauching the Illinois women. In response to this request, a sergeant and 12 men arrived, one being the diarist André Pénigaut. Relations with the Peorias had been strained for some time following the death of Father Jacques Gravier in 1708 and the Peoria mission had been closed. Hearing that the tribe was repentant, Marest and his confrères, Jean Mermet and Jean-Marie de Villes, decided it was time to put the mission again “on its old footing”; this was to be discussed during a visit to the superior at Michilimackinac, Father Joseph Marest. Gabriel Marest set out for Michilimackinac on Friday of Easter week, 1711, accompanied by several Indians who cared for him with kindness on the journey. He spent a fortnight in the village of the Peorias, then continued by the St Joseph River to the mission of the Potawatomis which was under Father Jean Chardon. There he found his brother Joseph who had come part way to meet him. They had not seen each other for 15 years. Father Chardon shared their joy and kept them with him a week before they embarked by canoe for Michilimackinac, where it took about two months to finish their “business,” on which Father Gabriel Marest has left no comment. Conversion of the natives was very difficult, wrote Marest; he found them indolent, treacherous, inconstant, thievish. Yet in his opinion they did not lack intelligence. He thought them “naturally inquisitive” and able to “turn a joke in a fairly ingenious manner.” Nearly all the inhabitants of Kaskaskia village were Christians, he reported. The settlement had grown; many Frenchmen had been attracted there and some had married Illinois women. On 15 Sept. 1714 Marest died during an epidemic, after an illness of only eight days. He was deeply mourned, the French singing his requiem while the Indians expressed their sorrow through symbolic gifts of fur. The following year a circular announcing his death was issued by Father Jean Mermet. In 1727 his remains were reinterred in the new Kaskaskia church by Father Jean-Antoine Le Boullenger. His many writings are his monument. His scholarship earned praise from his fellow workers who also attested to his unselfish devotion. Documents relating to Hudson Bay (Tyrrell). Early voyages up and down the Mississippi, by Cavelier, St. Cosme, Le Sueur, Gravier, and Guignas, ed. with intro. and notes by J. G. Shea (Albany, 1861). [André Pénigaut], Fleur de Lys and calumet: being the Pénicaut narrative of French adventure in Louisiana, ed. and tr. R. G. McWilliams (Baton Rouge, La., 1953). HBRS, XXI (Rich). [Jérémie], Twenty years at York Factory (Douglas and Wallace). JR (Thwaites), LXV, LXVI. Lettres édifiantes et curieuses, escrites des missions étrangeres par quelques missionaires de la Compagnie de Jésus (30v., Paris, 1707–73; nouv. éd., 26v., Paris, 1780–83), VI. Chapters in frontier history; research studies in the making of the west (Milwaukee, ). Delanglez, French Jesuits in Louisiana. Sister Mary Borgias Palm, The Jesuit Missions of the Illinois Country, 1673–1763 (n.p., 1933). Rochemonteix, Les Jésuites et la N.-F. au XVIIIe siècle. 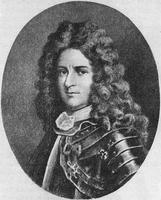 Marc de Villiers Du Terrage, La découverte du Missouri et l’histoire du fort d’Orléans (1673–1728) (Paris, 1925). Joseph Wallace, The history of Illinois and Louisiana under the French rule (Cincinnati, 1893). G. J. Garraghan, “New light on old Cahokia,” Ill. Catholic Hist. Review [Mid-America], XI (1928–29), 99–146. J. J. Thompson, “Illinois, the cradle of christianity and civilization in Mid-America,” Ill. Catholic Hist. Review, XI (1928–29), 65–85, 215–38, 329–48. Maud M. Hutcheson, “MAREST, PIERRE-GABRIEL,” in Dictionary of Canadian Biography, vol. 2, University of Toronto/Université Laval, 2003–, accessed April 24, 2019, http://www.biographi.ca/en/bio/marest_pierre_gabriel_2E.html.